500 People TFS Curve Tent for Wedding Tent is one of our newest products in the tent series, it was designed by us. More and more clients prefer this tent because of its special and elegant “heart” shape. 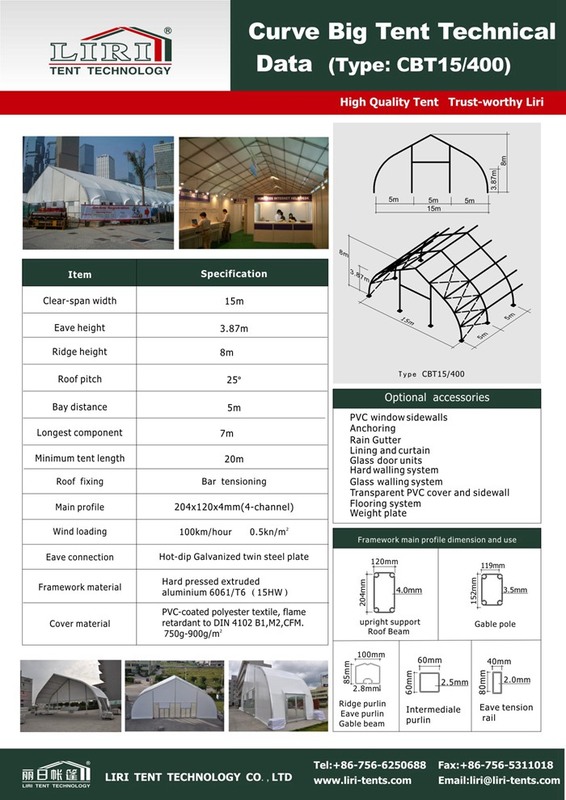 There are 3 types in the 500 People TFS Curve Tent for Wedding Tent series. These include CBT(span from 15m to 25m, main profile size 204x120x4mm), CEBT( span from 15m to 30m, main profile size 256x121x5mm), and CTH( span from 20m to 40m, main profile size 300x125x5/8mm). 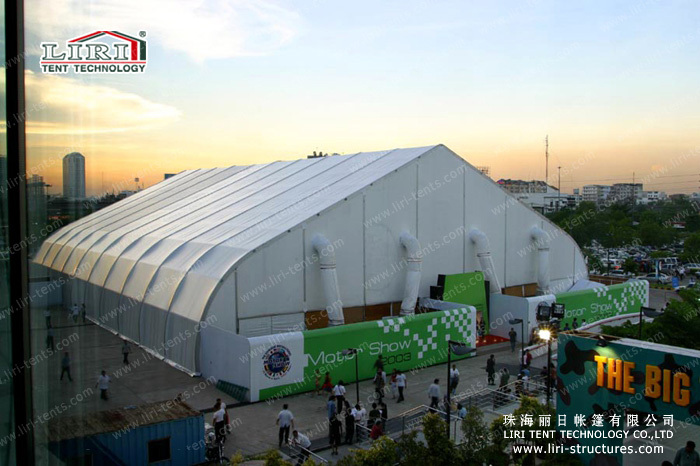 500 People TFS Curve Tent for Wedding Tent series are modular structures and can be increased or decreased in bay distance of 5m according to the clients’ requirement. The main frameworks (upright support and roof beam) are manufactured with high pressed extruded anodized aluminum (6061/T6) and the double-sided PVC roof covers use PVC-coated polyester textile. The flame retardance is based on the European standard DIN 4102B1, M2. 500 People TFS Curve Tent for Wedding Tent design is very durable and strong and the wind loading is 100 kg/hr. It is convenient and easy to set up and tear down. It is easy to store because of its small volume. This tent like the Big tent has a wide range of applications for temporary events. Whether you want to construct a temporary or permanent tent both are an excellent choice. This type of structure is superior because of its fast installation, dismantling, and transportation and because of its strength and security. Due to the high beam aluminum alloy curve design and perfectly extended system, it enables the tent to be resistance to high wind and snow speeds.